This project was a great opportunity to celebrate the success of alliances, like the many experiences I had while helping with the 2016 Canoe Journey, Paddle to Nisqually. I remain inspired by the collective effort expended in the direction of restoring a watershed that's key to this region. The result of a century of industrial activity has blocked the Skokomish River from above and capped it at the base — the entry to the Hood Canal — filling the riverbed with gravel and sediment. The upper dams were originally built to bring power to the City of Tacoma, and the lower dikes were created to attract ducks for hunting, among other things. It is heartening to know that it is possible for groups with dramatically different perspectives on land and resources historically, to come together in order to save it, and preserve it for coming generations. 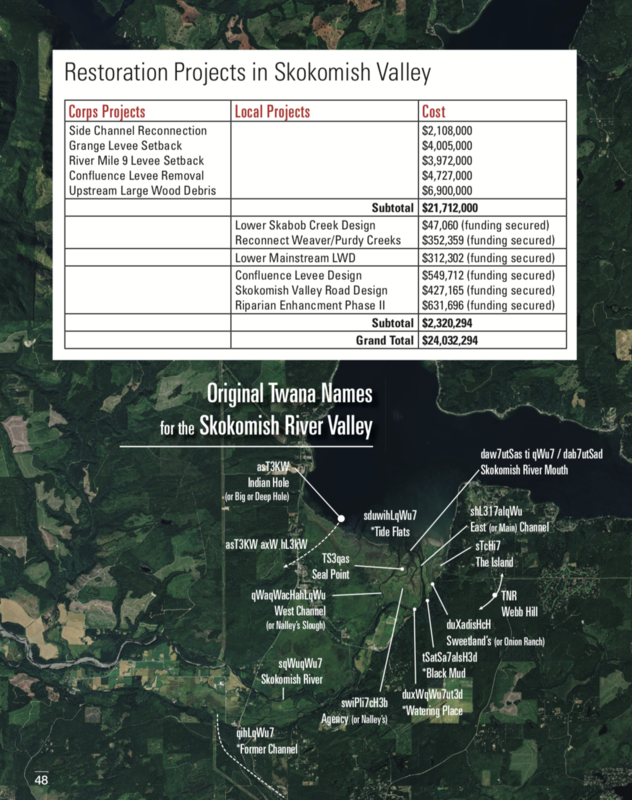 In 2007, the SWAT finalized a “road map” that enveloped these collaborative efforts in the Skokomish: Restoring the Skokomish Watershed, A Three-Year Action Plan. The SWAT action plan laid out an ambitious set of 42 restoration projects costing an estimated total of $48.6 million. Remarkably, as of 2016, virtually all of these projects – and more – had been completed or are nearing completion. The river has become clogged with gravel and sediment since, and currently the bed of the river is higher than the roadway which borders it. It is so congested the salmon who have tried to swim home have been forced in other directions, sadly onto the roadways in the valley. "The Skokomish River watershed is a vital part of the Hood Canal marine ecosystem and the nationally significant Puget Sound. However, degraded watershed conditions pose a threat to multiple species of fish and wildlife. Furthermore, substantial and recurrent floods and rising ground-water levels menace local communities. Restoration of a well-functioning watershed is necessary for species recovery and community revitalization. The GRuB Victory Famers began a fundraiser in late August 2015. I came on board to help with a number of activities including strategy and implementation as well as developing the brand they had already, marketing the program and establishing part of the communications used by a crowd-sourcing platform, including tutorials and posting content. The existing team there was great, motivated, professional and deeply committed to veteran healing and advocacy. Using their language and photography, I was able to create an introductory video offered an animated overview of the program, it’s tenets and aims. There are many organizations establishing programs that help returning veterans suffering from PTSD and TBI with their transition home from active duty — offering opportunities in small-scale and/or organic farming. One of a series of posts used via Instagram. Benefits of the program include the therapeutic effects of working with land and nature, as well as the space for fellowship to grow between veterans who served, and who can share experiences in a safe and non-confrontational space. Part of a post series used for Facebook. The program the GRuB Victory Farm has developed is unique because it incorporates community involvement and leadership training as well, in line with the GRuB model. Worked with the lead Estimator/Project Manager for the Seattle area at that time to update the family company logo, letterhead, building banners, detailed services brochure, vehicle wrap and magnets, and crew t-shirts. Letterhead - That you can edit! 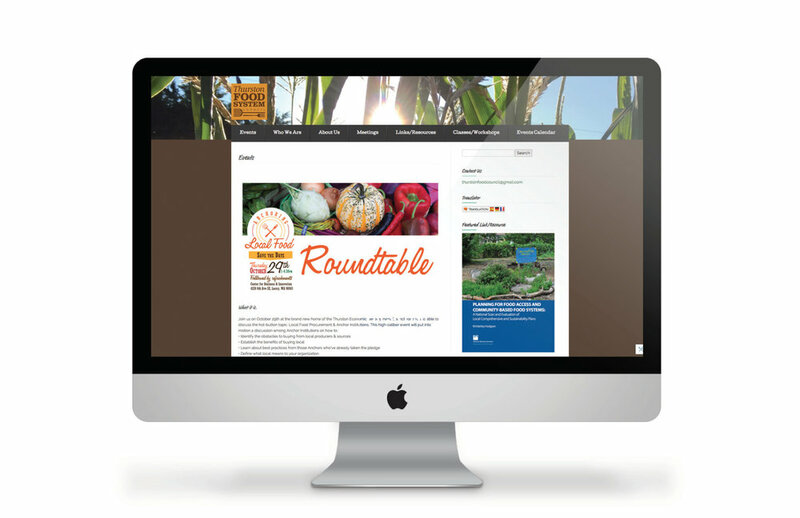 Now known as the South Sound Food System Network, located in Olympia, WA. I served as a volunteer in a communications aspect for the council for nearly two years, with the purpose of promoting local small scale sustainable agriculture. 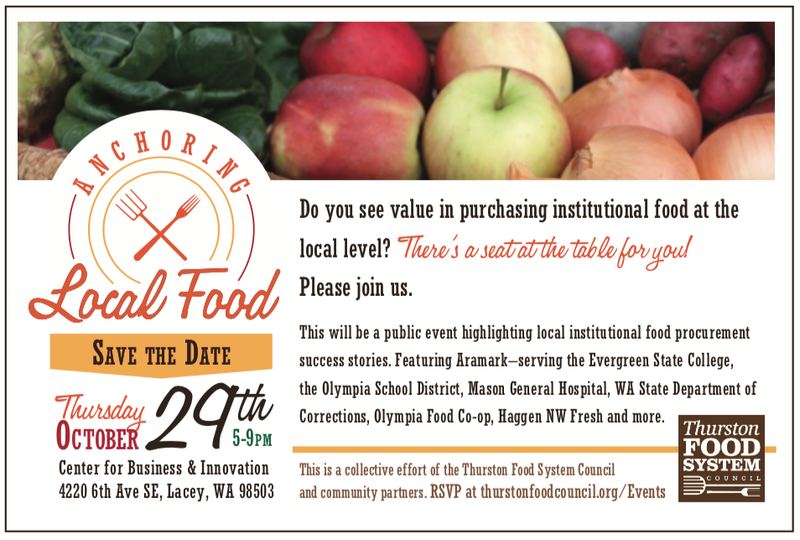 The topic of “Food Hub” for the local-to-Olympia area was heavily discussed in 2014-15, before that, after that. Robert Egger, founder of a massive community kitchen in Washington DC visited the council and shared some of his story behind operating it. 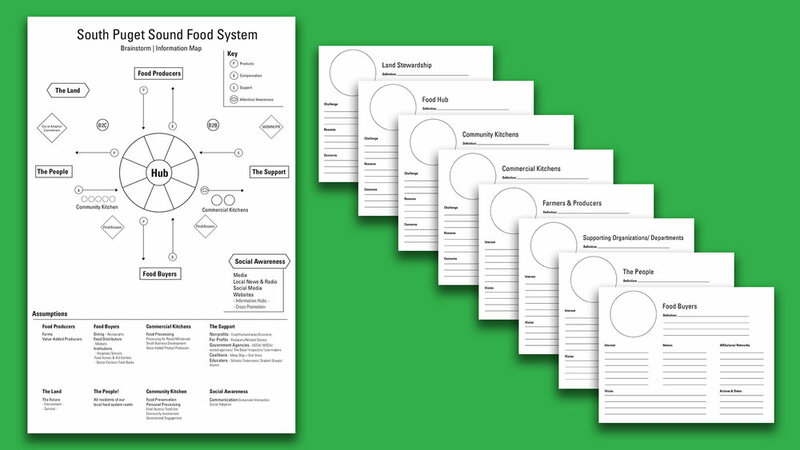 Inspired I developed this “Food System” map and worksheets. Presenting this here because right now I’m just available for hire, but if you’ve got an idea along these lines, I’ll bring it to life for you, in all kinds of media forms. After assessing the website in late 2014, my head-full of white papers on the benefits of community-food-systems, I pitched this to the council in hopes of becoming a part of it. Within a couple of months I was, and set to work implementing as much of this plan as possible. This event was meant to create conversations between food providers and institutions who purchase large quantities of food. In 2015 much of the food grown in South Puget Sound Washington was purchased by one distributor, transported 50 miles north, stored, sorted, inventoried and then institutions and restaurants purchased the food they could have had fresh and local as long as what they were purchasing fit their obligations to shareholders and regulatory agencies. A long way of saying “local farmer” operating on a non-commercial basis. The Boise area used to be full of small farms and ranches that have since been pushed farther and farther out of the growing city. As with the rest of the nation, commercial interests and convenience foods drove demand for fewer and fewer types of crops. Concentrated animal feeding operations have replaced many local ranching operations, and food-related dietary troubles had been an ongoing topic of concern. The effort of these gatherings was to encourage mutually beneficial partnerships that would lead to healthier people, and healthier local economy. At the time of this event just 2% of the regional food available was purchased locally. The Olympia area of Washington has many lush farms within it and south of it, and it was a tragedy to realize this. There were a number of people passionate about addressing this, and worth the time and effort of all involved. Members of the network included the local Conservation Districts of two counties, area farmers when they could, college extension programs, youth and family health advocates, community program directors, health department employees, teachers, students, small business development from state and privately funded groups.